If you’re shopping for a gift for a loved one, it’s always good to buy them something that aligns with their interests. If your friend or family member loves or owns pet hedgehogs, then giving them a hedgie gift is a fantastic idea. 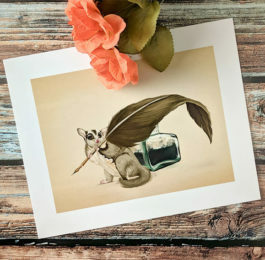 There are plenty of cute, fun, and creative gifts you can give to honor their favorite animal. We’ve rounded up 10 gifts you won’t find in stores that will surprise and delight your loved one. Any of these gifts are great for a birthday or to wrap up under the Christmas tree. Aroma Home makes this cuddly set of slippers any hedgehog owner would love! These toasty warm and super soft slippers are perfect to keep your feet warm and cute any time of year. One size, great for older kids and adults. This funny and cute t-shirt is must-own for any hedgehog owner. This shirt is for people who are “Livin’ on the hedge!” The fun play on words comes with a cute hedgie illustration. Available in men’s, women’s, and youth sizes in royal blue, baby blue, silver, yellow, and pink. Also available as a hoodie. This is a great hedgehog gift for any coffee or tea drinker. 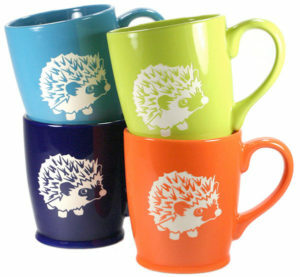 These brightly colored ceramic mugs are carved down to the stonewear to great a bold image of an adorable hedgie. Gift it with some of your loved one’s favorite coffee or tea for a gift they’ll be thankful for every morning. This cute infinity scarf from Lina & Lily is a must have for any hedgehog lover. The print features adorable little cartoon hedgies. Made of soft, lightweight fabric, this scarf is the perfect fashion accessory for any time of year. Available in five colors so you can find the perfect gift: white, gray, blue, black, dusty pink. This is a cute little gift for hedgehog owners. 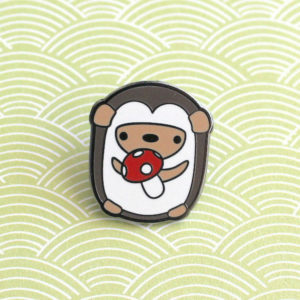 This hard enamel pin features a round hedgehog holding a mushroom. 1″ tall it’s perfectly sized to attach to any jacket or bag and makes a fantastic stocking stuffer. This is an adorable addition to any dinner table. This set of salt and pepper shakers features a pair of loving, kissing hedgehogs. They even feature magnets in their mouths so they snap together for the kiss. 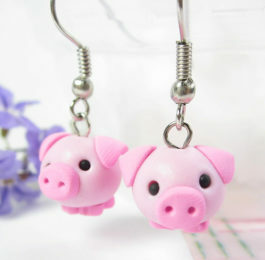 They’re made from hand painted ceramic and come in a gift box. Looking for a stocking stuffer? 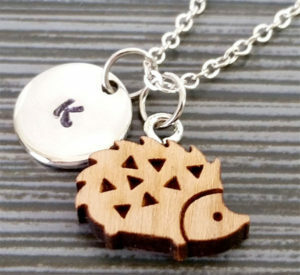 This handmade wooden hedgehog necklace make a great gift for any hedgie fan. It’s laser cut from wood and comes with an optional hand-stamped initial charm. 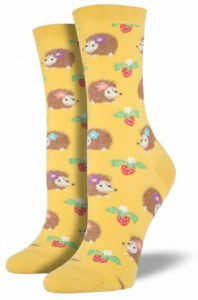 These cute little socks are great for hedgie lovers. Available in blue or yellow, they feature little cartoon hedgehogs with strawberries. These make a great compliment to the hedgehog slippers. Shopping for a coworker who loves hedgehogs? This is a one-of-a-kind gift you won’t find in stores that they will love to display on their desk. 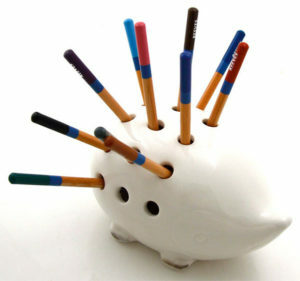 This handmade ceramic pencil holder is in the shape of a hedgehog. Just add pencils and pens for the cutest desk accessory. Let your giftee embody the hedgehog life with these cozy pajamas. This adult onesie is designed to make you look like a hedgehog. It features a little tail on the back and a hood with a cute hedgehog face and ears. Perfect to keep warm and cozy on a cold winter night or makes a great easy, lazy Halloween costume. Makes a perfect Christmas gift. Here’s a gift that’s useful and adorable! Made from sturdy canvas, this bag can carry all of your stuff but also show your love of hedgehogs. A cute hedgie is peeking out of the pocket! Slip some other small hedgehog gifts inside and make it a gift bag! 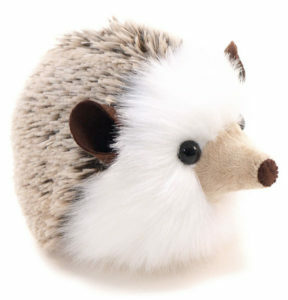 This is a great gift for a loved one who doesn’t have a pet hedgehog yet or likes to collected stuffed animals. All of Fuzziggle’s stuffed animals are handmade, making them unique and thoughtful gifts. Give your hedgie lover this adorable plushie. A great gift for cooks, this little kitchen timer features an adorable brown hedgehog. Just give him a twist to set any time up to 60 minutes. This little timer is perfectly sized and priced to include in a gift bag or give as a stocking stuffer. This adorable throw pillow is a must-have in any hedgehog lover’s home. Made from durable cotton linen, it features a cute illustrated hedgehog with multicolor quills. This is the pillow cover only, you have to buy the pillow separately. This t-shirt is cute and funny. 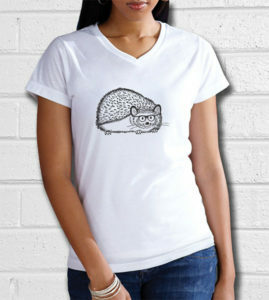 It features an illustration of a hipster hedgehog on a classic white t-shirt. Women’s sizes, made in the USA. This is such a clever kitchen tool that I wish I’d come up with it. This hedgehog is actually a cheese grater, perfect for all kinds of kitchen needs. Comes in five colors. This is a great gift for and hedgehog lover who enjoys cooking. Every hedgehog lover would enjoy having these dish towels in their kitchen. Made of 100% cotton, this set of dishtowels features whimsical illustrations of hedgehogs. The yellow and ivory towels are perfect to go with any decor and add some extra fun to any kitchen. This is the perfect t-shirt for the homebody hedgehog owner in your life. It says the truth most hedgie lovers know: they’d rather stay home and hang out with their pet. Funny gift for hedgehog owners. Available in men, women, and youth sizes in black, purple, navy, royal blue, and brown. This is a unique and fun gift for the crafty hedgehog lovers in your life. Kirikipress makes a variety of DIY animal doll kits for differing experience level. This hedgehog doll is Level 3, so it’s a challenging project for adventurous beginners are seasoned pros. 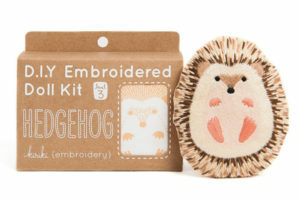 The kit has everything they need to make their own adorable hedgehog doll. Just added a new hedgehog to your family? Check out this megalist of the best hedgehog names.